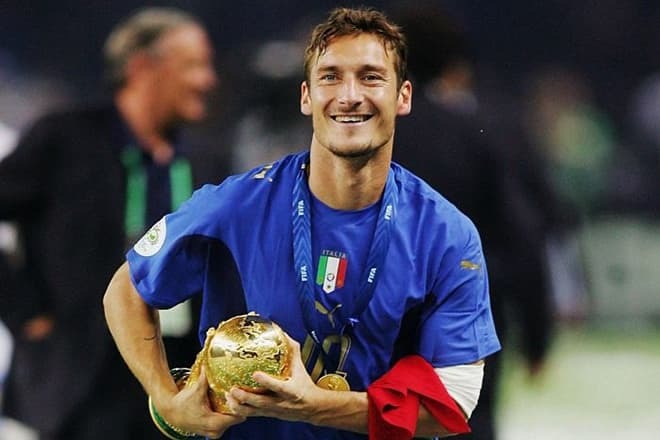 Francesco Totti, the attacking midfielder or second striker of the Italian football club, is called Il Capitano (“Capitan”), Il Re di Roma ("King of Rome"), and even "King of Roma." He spent a quarter of a century on the football field. He played for one club for 25 years. Francesco was born on September 1976 and became the second child in the family of the bank clerk Lorenzo and the housewife Fiorella. The boy fell in love with football very early. According to legend, he was playing with the ball even before he took his first steps. The boy often took the ball with him to bed. When Cesco became older, he developed high-speed qualities and took the example from his idol Pietro Mennea, the 1980 Moscow Olympic 200 meter champion. Also, Totti attended a church school. The footballer recalls that when he was a teenager, he didn’t believe that the dream of significant sports achievements will come true. The 13-year-old boy had a small growth and even went to doctors. But in one moment he suddenly grew up. The athlete decided that it was the will of God. His prayers have been answered. The agents of "Lazio" noticed the talented boy. And the mother of a young football player refused the representatives of "Milan." Not one generation of the family was fans of Roma. Then, according to Francesco, he realized that the house is the most important thing. Playing for the "wolves," as people call the Roman club, Francesco made his debut in March 1993, in a match against “Brescia.” According to the other information, he debuted in the match of the Italian Cup against “Sampdoria.” The footballer scored his first goal in 1994 in a friendly match against "Valencia." 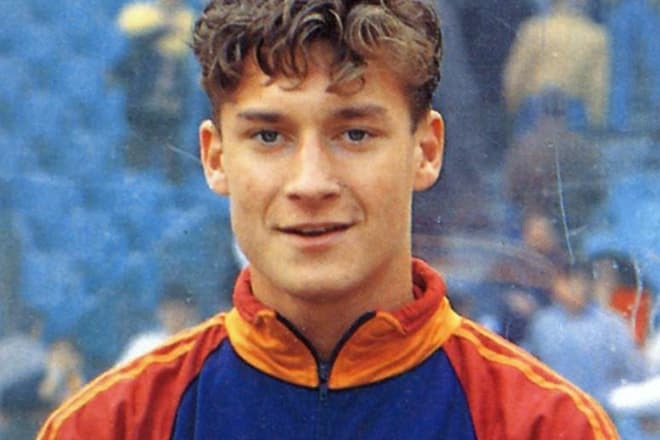 Francesco Totti with a T-shirt of "Roma"
By 1995, Francesco began to appear regularly in the senior side and in the next three seasons scored 16 goals. In his interviews, Totti always stated that it was the coach of the club, Carlo Mazzone, who helped him to become a great football player. With the arrival of the Czech coach Zdeněk Zeman, the Italian finally got to the main team. And soon he became a captain. The player scored 30 goals and won the prize of The Italian Footballers' Association as the best young player. Fabio Capello replaced Zeman, and the club won the 6th place in the national championship. Francesco was awarded Footballer of the Year Award. The athlete believes that season 2000-2001 was one of the best in his career. Then the club was under Capello. 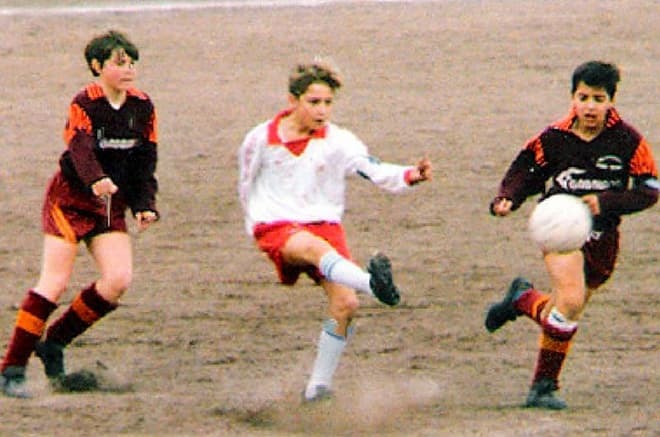 Marco Delvecchio and Gabriel Batistuta played in one field with Totti. Cesco won the title of the winner in the highest league of the national championship "Serie A" as well as the title of one of the highest paid football players in the world. In the next three years, the striker was injured. So he missed half the season. Nevertheless, in 2003, Francesco set a record for goals scored in Serie A and again was recognized as the best player in the country. Francesco is not only turned an ordinary penalty into an art. He is the football player, whose sports biography has started and ended in one club. Moreover, the "Emperor of Rome" holds the record for the number of goals in Serie A, the number of matches in Derby della Capitale, the number of matches and goals for "Roma" in Euro Cups. He played 619 games in the Italy Championship. Only the defender of "Milan" Paolo Maldini is ahead of him. "Roma" for me above all: above me, my ambitions, my personal life. For me, "Roma" is everything. " At current prices in the football world, the transfer would have cost the Italian club € 200 million. 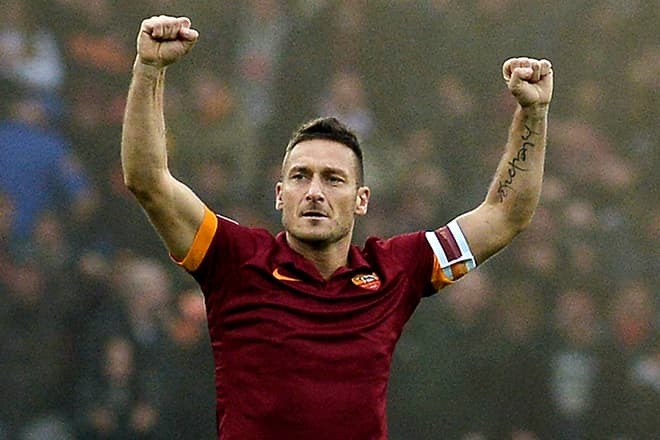 Totti defended the colors of his native club in 786 matches, scored 307 goals. Together with the "wolves," Francesco won the championship, two Cups and two Super Cups of Italy, and also became the world champion in 2006 as a member of the Italian national team. He played 58 matches and scored nine goals for the national team. The only reward the famous player didn’t get is the "Golden Ball." Francesco is happily married to a TV presenter and model Ilary Blasi. They have a son Cristian and daughters, Isabel and Chanel. 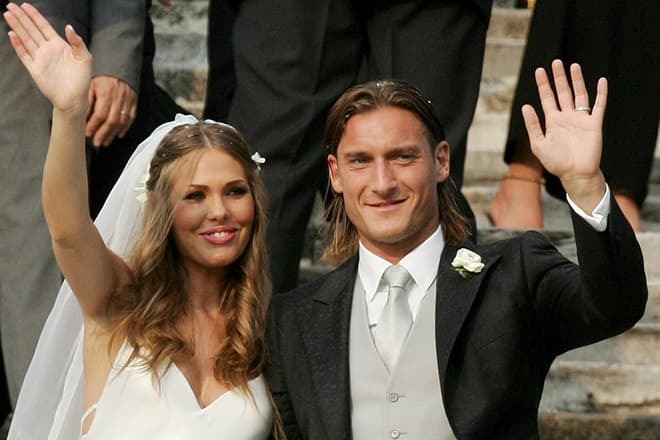 Totti met his wife at a disco. Despite the fact that Ilary was the fan of "Lazio" club, the girl agreed to go on a date. Then the footballer invited his girlfriend to the match against “Lazio,” whom "Roma" defeated. And Cesko showed a T-shirt with the inscription "You are unique" during the celebration of their victory. From his wife, Totti took a habit of sucking his thumb when he scored a goal. The wedding of the couple was broadcast on television. Totti sent the raised money to a shelter for homeless animals. The couple owns “Never Without You” clothing brand, a football school "Number Ten" and a motorcycle racing team “Totti Top Sport.”. Moreover, Francesco wrote several books and starred in a movie. Footballer nicknamed Gladiator has beautiful appearance - the growth of 181 cm and weight 82 kg. Totti also was the face of "Nike," "Diadora," "Fiat." The family likes to relax on the beach. And even his page on the "Instagram" begins with a photo of children and parents sitting on the beach. In May 2017, the legend of Italian football finished his career as a football player. He played the last game in the match against "Genoa" in the 38th round of the Italian championship. 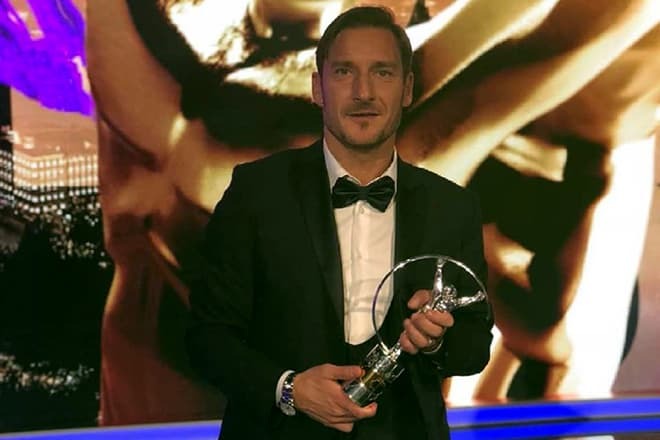 Totti immediately became a technical director of "Roma" and got a special award from the President of UEFA. There are only 17 people, who got this award: Eusébio, Franz Beckenbauer, Alfredo Di Stéfano, Johan Cruyff and others. According to La Gazzetta dello Sport, later Francesco decided to visit coaching courses in Trigoria to get a license. However, as the Association of Coaches of Italy reported, Totti changed his plans for coaching and did not start training. 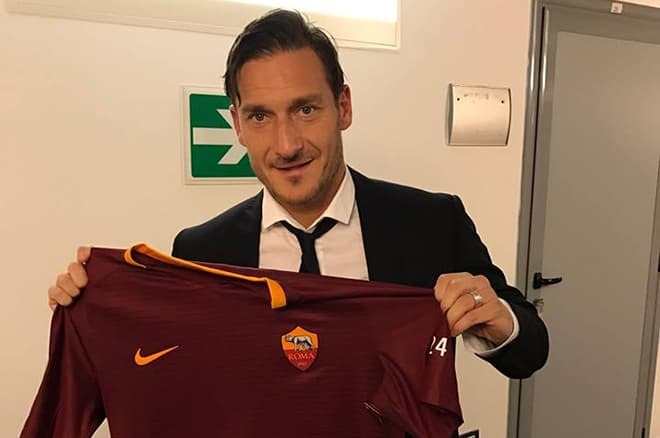 After Totti finished playing in "Roma," he received an offer from the Japanese club of the second division "Tokyo Verdy." However, the footballer's wife refused to move to Japan. 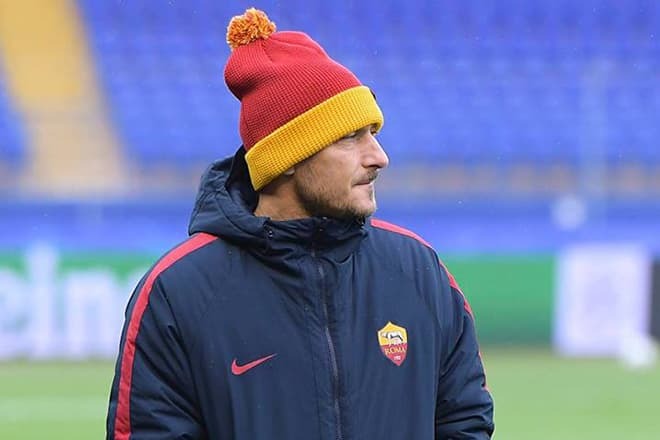 According to the president of the team, Hideaki Hanyu, Totti wanted to move to the Far-East, but it was impossible to convince Ilary. In March 2018, the Italian bookmaker Sisal began accepting bets with a coefficient of 100 for the return of the legend of "Roma" to Serie A. The reason for this was the words of the current coach of the team that he considers Ryan Giggs, Gabriel Batistuta, and Francesco are the perfect attackers. In February of the same year, Totti participated in the Legends Cup in Moscow. According to the football player, the tournament was difficult. Firstly, because of a bad cover of the stadium. And secondly, the players "at a certain age are tired." Nevertheless, Francesco was glad to meet his old friends and noted the warm welcome of Russian fans. Shortly before the match, the ambassador of the World Cup Victoria Lopyreva visited the home stadium. She met the technical director and former footballer of "Roma" Francesco Totti, who gave her a name T-shirt with the number 10, under which he once played.